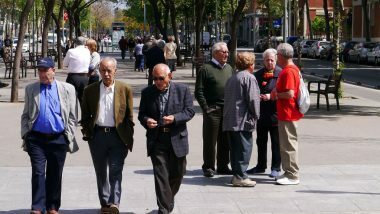 At present one in five people in Barcelona are over the age of 65, a figure which is set to rise in the coming decades with the population ageing due to a combination of a low birth rate and a longer life expectancy. 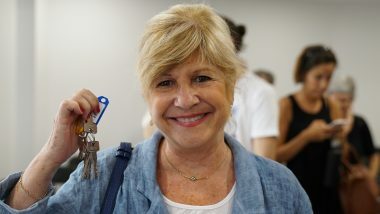 It’s estimated that in 2030 one in three inhabitants in the city will be 60 or over and that 66% of those over 80 will be women. 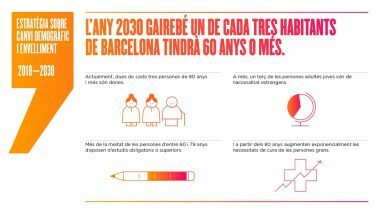 To adapt the city to these demographic challenges, the strategy for demographic change and ageing 2018-2030 is being put in place, with 77 measures to boost community services, integrated care services, active ageing and intergenerational coexistence. The city has around 165,000 people over 75, a third of whom live alone, with 13 registering for the telecare service every day and 6 joining the home help service. This is a society with an average life expectancy of 83 and rising. 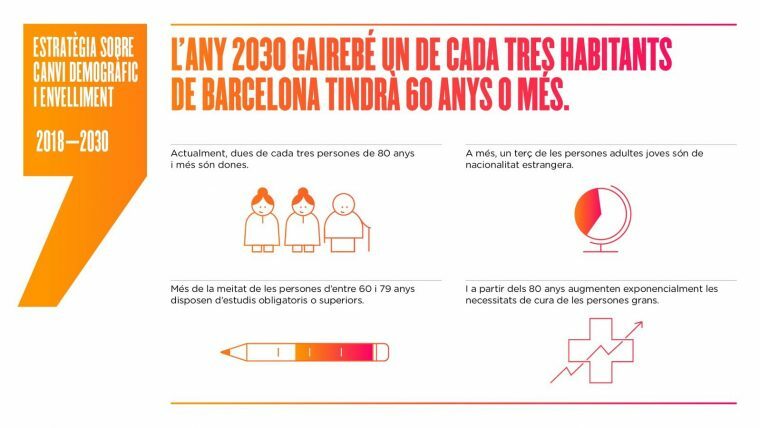 In 2030 a third of city inhabitants will be 60 or over and 66% of those over 80 will be women. The trend also shows a change in the profile of forthcoming generations of elderly people. On one hand, they will be better qualified academically, with longer professional careers and better health. On the other, the number of people with debts or who do not own a home will increase, affecting the management of household finances. 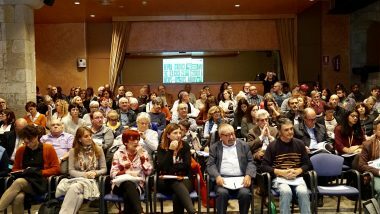 Presented within the context of the participatory process at the fifth ‘Voices of the elderly’ convention, to be held on 5 and 6 March 2019, the strategy for demographic change and ageing 2018-2030 is the result of joint work by experts and various types of participation and takes this analysis as its starting point. 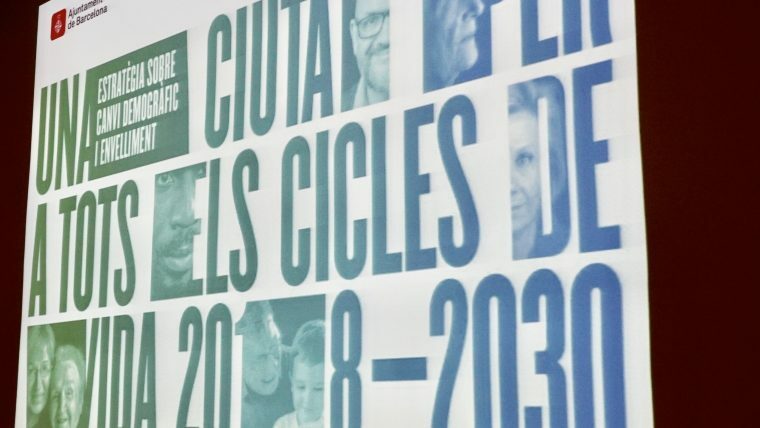 The goal is to anticipate municipal policies which adapt to demographic change and adjust services and facilities to the needs of future generations. The city offers 62 services for the elderly and upped the corresponding municipal budget by 65% between 2015 and 2018, increasing it from 83.8 million euros to 138.3 million euros. 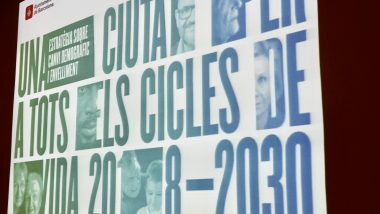 In order to adapt to the demographic trend, the new plan has 77 measures organised into four main thrusts: to back public care services, to foster coexistence and intergenerational exchange, to facilitate learning and opportunities for participation and to further examine the social and urban effects of demographic change. To improve access to support for the elderly and move forward in terms of setting up the care superblocks (areas in neighbourhoods with various social services and community spaces), a mapping process has been carried out for the whole city, block by block, with the social profiles of users. This will help give a more detailed picture of the most suitable locations to group together facilities. Senior citizen friendly paths are also to be developed, along with measures to facilitate access to culture and bridge the digital divide, a white paper on education and an analysis of the needs of the most vulnerable groups in order to plan specific measures and more.